Little Christmas for the ladies. The modern Christmas in Ireland seems to get underway some time in October when decorations, cards, food fancies and festive gifts begin to appear in shops and on TV. While many complain about this long build-up and the over-commercialisation of what used to be purely a religious festival, the holiday season doesn't really begin in earnest until Christmas Eve: 24th December. Of course, there will have been plenty of preparation in terms of buying and cooking and present-buying before then. It was always so. In the lead up to the holiday, our ancestors used to visit special markets, typically held in the major towns, which focussed mainly on seasonal food but also offered some gifts (see the Irish Christmas recipes page for more about these markets). Below are some of the traditions, both old and of more recent heritage, of certain days of the festivities. This is the day for final household preparations and decorating the interior of the house. For our rural ancestors, the decorations were gathered by the children of the house from lanes and woods nearby. Dressing the fir tree on Christmas Eve is a mid-20th century development of this tradition. In practice, many, if not most, modern homes have had their tree in full celebration gear for a week or three and it is already the main focus of the family's living room. Wrapped presents collect beneath it. If it hasn't already been done, lit candles are placed in windows as dark falls. Again, this is an old tradition, symbolic of lighting the way for Mary and Joseph. Welcoming refreshments are also left out for them. Traditionally this is a small seed cake and drink. Many Irish families still go through this little ritual, but many more leave out a mince pie, glass of whiskey and a carrot, intended for Santy and his reindeer who bring gifts for children (only those who've been well-behaved, of course) during the dead of night. Perhaps the most prevailing tradition of Christmas in Ireland is attendance at Midnight Mass; most churches are packed on Christmas Eve. Children discover their gifts from Santy/Santa (rarely Father Christmas) at the foot of their beds or beneath the Christmas Tree (depending on family tradition) on this morning. Morning is also the time when most of the madcap swims take place around the freezing coast (see box in left column). Most of these are organised for charity and the individuals taking part are sponsored to take their chilly dips. The rest of the day is spent exchanging gifts, eating an extravagant feast of traditional Irish Christmas recipes and generally indulging the palate. Making merry usually involves drinking seasonal concoctions such as mulled wine, Irish cream, whiskey, sherry and champagne. Christmas Day in Ireland remains primarily a family occasion. The 26th December is known as St Stephen's Day in Ireland. In Northern Ireland it's also known as Boxing Day. In most homes it is a sociable day, when visitors may call in to share some seasonal foods or liquid (usually alcoholic) refreshments. Sport is also high on the menu throughout the twelve days of Christmas in Ireland and several horseracing meetings start on St Stephens. But there's no need to attend the track. My Nana Tierney always made sure she placed a few bob each way on a St Stephens meet, and I don't think that she ever visited a racetrack in her life. (I don't think she much liked horses, either!) But the thrill of the race when a few pennies were riding on it was a different matter. 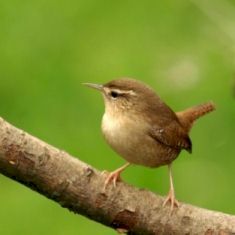 St Stephens is also the day when a purely Irish phenomenon can be witnessed: the tradition of Hunting the Wren. This is when the Wren Boys take to the streets in colourful costumes and masks, and noisily parade a dead wren on a decorated pole. It's a strange tradition and its origins are often debated. Some say it originated in Pagan times. Others from the Viking invasion. Most opt for a simplified religious reference: the betrayal by a wren of St Stephen who was hiding from the Romans who subsequently killed him for his Christian beliefs. This, then, gave the reason for hunting down the wren, and in olden days a bird was, indeed, captured and killed. The Wren Boys would then carry the dead bird on a pole from house to house and beg for money to bury the 'evil bird'. on St Stephen's Day it was caught in the furze. Over time, and probably in only a few isolated instances, the mischievous antics of some Wren Boys grew increasingly boistrous and disorderly. My mother remembers being terrified of the Wren Boys when she was a little girl growing up in County Carlow, and convinced herself they'd take her away if they found her (she always had an active imagination!). She admits to being rather glad when the tradition started to wane. Hunting the Wren used to be a widespread celebration of Christmas in Ireland, but it is now observed in only a few locations (mostly in the southwest and Dublin), and is a much more organised affair than it used to be. Instead of running amok, the Wren Boys parade through the streets with music and collect money for charity from spectators and from the many pubs and bars they visit on their way. The 6th January, or the Feast of the Epiphany, commemorates the arrival of the three Kings or Wise Men at the crib. It is the final day of Christmas in Ireland and is the time when all seasonal decorations have to be taken down. Failure to do so results in bad luck, so the superstition goes, unless you leave them up for a full twelve months! This day is also known as Little Christmas in Ireland. In Irish, Nollaig na mBan, means Women's Christmas. Traditionally, the woman of the house was given a day off after the twelve days of cooking and acting the hostess. Instead, the men would take over family responsibilities while the women went out with their friends. It was probably the only day of the year when the local bar would be full of women rather than men. Sadly, this is another tradition of Christmas in Ireland that is dying out. There have been attempts to revive it, and some restaurants, bars and hotels still try to entice groups of female friends with special deals. However, in a society where so many women now work outside the home and are economically independent, it seems destined to quietly fade away. I readily confess that I'm no mathematician but I count 14 days, not 12 days, from 24 December to 6 January inclusive. Apparently there are reasons for this confusion about the Twelve Days of Christmas. They are to do with Eastern and Western Christian religious observances, and a habit of counting nights as days. All very complicated, and not of any relevance to celebrating Christmas in Ireland! Just accept that whenever the festive partying starts, it ends on the 6th! More about the traditions of Christmas in Ireland. Try some traditional seasonal recipes? 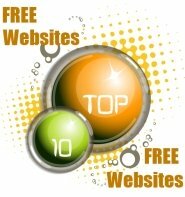 Go to Irish Genealogy Toolkit Homepage. Watch this video of the Christmas morning swim at Lahinch, Co Clare. As you'll see, there's not really a lot of swimming going on. It's more of a 'freezing dip + loud squeal' experience! Choose your favourite family tree template from Toolkit's exclusive free range. 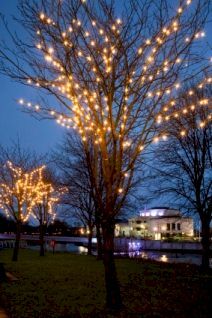 Top right: Christmas tree hung with golden lights cast a festive glow in Lisburn, Northern Ireland. 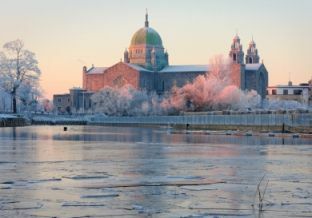 Middle: Galway Cathedral during the 2010 Winter freeze.